As previously mentioned, the Iron Man line was canceled due to poor sales. Series IV barely made it into wide circulation before the line was no more. 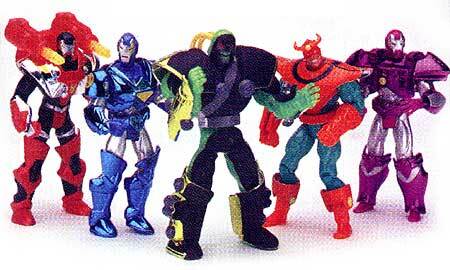 However, before Toy Biz had decided to scrap the entire line, one final assortment was shown. This series has become one of the most talked about groups of unreleased figures ever. Fans of the line clamored for a release of these figures somewhere (such as the exclusive Hall of Fame Series for example). Jesse Falcon of Toy Biz has said that they are looking for an appropriate venue for the Iron Man V set, but that they would be repainted in some manner. Rather than just let the Series V molds fade into oblivion quietly Toy Biz revamped the bodies and armors and created new characters out of them for the Spider-Man: Techno Wars and X-Men: Mutant Armor series. For a nice look at the Unreleased Prototypes, check this page out. All images, format, content, and design are copyright © 1994-2001 Raving Toy Maniac, Eric G. Myers, and Jason Geyer. No part of these pages may be reproduced without express written consent of the Raving Toy Maniac. Licensed character names and images are copyright © their respective companies. Top photo by Paul Schiraldi.